Recently, I visited our family’s safe deposit box to acquire a document that I needed. While looking for the document, I came upon old medals and rings that were given to me as a child during different sacramental occasions. These different medals made me think of the importance of sacramentals in the Church and today I wanted to write on the Miraculous Medal. I wore the Miraculous Medal as a child for some time. Now I wear a Brown Scapular. The Miraculous Medal or the Medal of the Immaculate Conception begins with the Apparitions of Rue du Bac in Paris, France at the motherhouse of the Sisters of Charity. 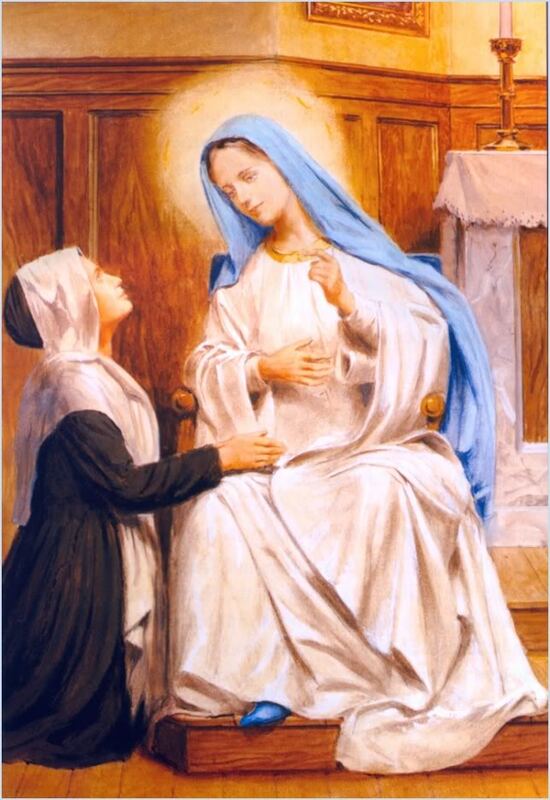 In the year 1830, Sr. Catherine Laboure (now St. Catherine Laboure), received three apparitions – 1. The “Virgin of the Chair” (July 18, 1830); 2. the “Virgin of the Globe” (November 27, 1830); and 3. 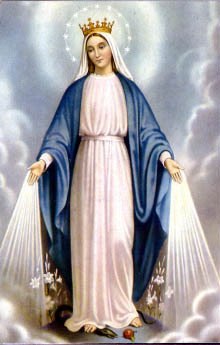 “Our Lady of the Miraculous Medal” (November 27, 1830). 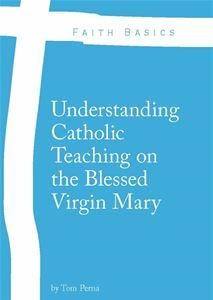 The Virgin Mary also told Sr. Catherine that the Vincentian Fathers and Daughters of Charity were in need of much reform (see LCWR supporters – reform has happened many times in church history). She said that a new community would develop from the Daughters of Charity. This came to fruition when St. Elizabeth Ann Seton’s Sisters in Emmitsburg, MD would eventually join the Paris community. As she wept, the Virgin Mary told Sr. Catherine of the great dangers that would come to France and the world. Nine days after this first apparition, there was a revolution in Paris by Charles X to reestablish the “divine right” to the Bourbon monarchy. However, he was trampled upon in the “Three Glorious Days” where monarchists, merchants, and radical anarchists attacked the Church by beating, killing, and imprisoning priests and religious. They burned churches and pulled down statues and crosses. The Archbishop was force to flee for his life. The apparition prophecy of nine days earlier came to pass. On the backside of the medal, we see the “M” connected to the cross with the crossbeam. This represents Mary’s Co-Redemption with her son and her role as Co-Redemptrix but always subordinate to Him (Jn 19:25-27). Mary is able to crush the head of the serpent by the power of Our Lord, not with her own power. The two hearts on the bottom of the medal (Immaculate Heart of Mary and Sacred Heart of Jesus) define the whole age of Mary and the motif of the Marian messages to the modern world. The hearts of Mary and Jesus would be developed in the message of Fatima. The triumph of the Immaculate Heart leads to the Sacred Heart of Jesus. 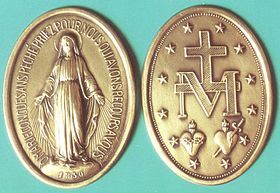 The twelve stars on the back of the medal represent Mary’s universal queenship (Rev 12:1), she is also the mother of the male child (Rev 12:5), and the mother of the “rest of her offspring” (Rev 12:7). She is our Queen Mother (1 Kings 2:19-21). The twelve stars also represent the twelve apostles who fulfill the twelve tribes of Israel. Mary is known in the Tradition of the Church as the Queen of the Apostles. The first medals were struck in 1832 under the permission of the Archbishop of Paris, Monsignor de Quelen. In 1836, the Church investigated the apparition as well as the miracles attributed to the medal and said that there was a supernatural authenticity. In 1842, due to the conversion of a famous European Jewish figure, the Church declared the Miraculous Medal devotion approved. It is believed that the Miraculous Medal was the defining factor in promulgation of the Immaculate Conception being declared dogmatic on December 8, 1854 by Bl. Pius IX. Sr. Catherine Laboure died in 1876. Fifty-seven years after her death, while her cause for Canonization was occurring, her body was exhumed and was found incorrupt. On July 27, 1947, Pope Pius XII canonized St. Catherine of Laboure. The Miraculous Medal is worn by thousands of Catholics on a daily basis. This great medal and the apparitions to St. Catherine Laboure show the importance of many Marian doctrines and dogmas – most notably her Immaculate Conception, Co-Redemption, and Mediatrix of all graces. I love your dedication, devotion, and consistency with these posts. Keep up the great work and best of luck with your new job. Thanks William! 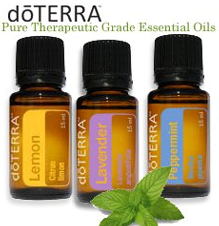 Please share this post with your family and friends. Mondays with Mary…clever. Glad I found your blog.